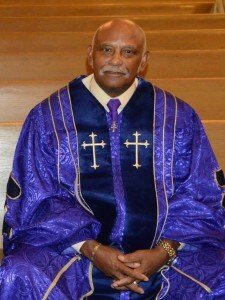 Bishop Dr. Tommie D. Lockett is the Founding Pastor and Senior Presiding Bishop of the Faith Temple Churches of God, Incorporated of Kalamazoo, Michigan. He was installed as Bishop in 1971. Bishop Lockett and Quella Fields were married on Christmas Eve, 1956. They have been blessed with 11 children and many grandchildren and great-grandchildren. All 11 of the Lockett siblings and their spouses work faithfully and diligently with their parents in the ministry at Faith Temple Church of God, serving in many capacities. Bishop and Sis. Lockett and Sis. Joyce Moore-Robinson were very instrumental in helping establish the Church of God Pentecostal (Kalamazoo), which was founded by the late Bishop Lafayette W. Davis and his wife, Stella, circa 1961. Bishop Lockett served this ministry faithfully in many positions, first as a deacon, to eventually being appointed as the Assistant Pastor. Bishop Lockett felt the call of God upon his life to build a church, and in 1967 he and Sis. Lockett founded the Faith Temple Churches of God, Inc. Bishop Lockett is a Visionary Leader, a great man of Faith and a Pastor-Builder. God has used him to build or renovate several church facilities over his 50+ years in ministry. Bishop Lockett loves the people of God and is a passionate soul-winner: Many souls have been saved, healed and delivered under his pastorate and the anointing which flows through this great man of God. Not only is he concerned about spiritual well-being, he is also concerned about the people’s physical well-being. Bishop Lockett is the founder of the New Direction Outreach Center, an outreach ministry of Faith Temple which ministers to and feeds the hungry and homeless of the community. He and Sis. Lockett have been blessed to make two mission trips to West Africa. In recognition of Bishop Lockett’s many contributions, leadership and labor, the Ministerial Training Institute of Inglewood, CA. conferred upon him an honorary doctorate degree in 1999. Bishop Lockett loves to minister in song! He founded the Gospel quartet, “The Mall City Jubilees” and God blessed him to record his original music in the 1960’s, the 1970’s and he went on to record his song “Doin’ the Best I Can With What I Got” in a duet on Melvin Williams’ (of The Williams Brothers) solo album, “Never Seen His Face” in 1998. The song also features the renowned Mississippi Mass Choir on background vocals. That project garnered two Stellar Awards. Bishop T.D. and Sis. Quella Lockett have served their church family and community with Faithfulness, Righteousness, Excellence, Obedience and Integrity for over 50 years. God blessed Bishop Lockett to recently celebrate his 80th birthday—as the Bible says, “..and if by reason of strength they be fourscore years” (Psalm 90:10). The Faith Temple Church of God family thanks God for His gifts to this body of believers, Bishop Dr. T.D. and Sis. Quella Lockett.